Leonardo Bonucci has claimed that he turned down a move to Manchester United in order to return "home" to Juventus during the transfer window. The Italy centre-back controversially swapped the Serie A champions for AC Milan ahead of the 2017-18 season but completed a move back to Turin after a disappointing campaign at San Siro. 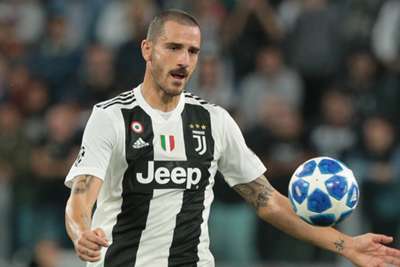 Bonucci – who is likely to face United in the Champions League on Tuesday – has now said that he turned down an approach from Jose Mourinho's side, as well as one from their local rivals Manchester City, before his Juve homecoming. Asked by The Telegraph if he received an offer from United at the end of last season, the 31-year-old said: "Yes. "The decision was not made until June but it's true that I had this feeling inside me [to return to Juve]. "So, when my agent told me there was a tangible opportunity to go back I just stopped listening to anyone telling me what to do, I stopped listening to any kind of suggestion and I just said 'okay, let's go home'. "There have been some possibilities both with Manchester City and with Manchester United. With Manchester City when I received that offer [in 2016] I actually talked to the club, I talked to Juventus and we decided that it was good for me to stay and to keep on winning with Juventus. "And this year when I was told there was a possibility to go back home, to come back to Juventus I just stopped listening to any other offers and I decided to come back here. "Here, I really do my best, I just push myself to the maximum and that's something at Milan I really didn't manage, I didn't succeed to achieve and that was probably because in my heart I had already made the decision that I wanted to go back home."